Each handler configured as a Spring bean is going to have a corresponding RegistrationChainHandlerConfig instance (and database row as well). 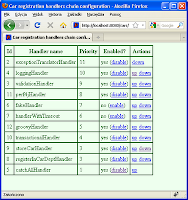 handlerName is a Spring bean name, priority is simply used to control the order of handlers. The bigger priority, the sooner this handler will be executed. Also enabled attribute has been introduced – instead of decreasing the priority (probably moving the handler after CatchAllHandler) it can be simply disabled and temporarily ignored. 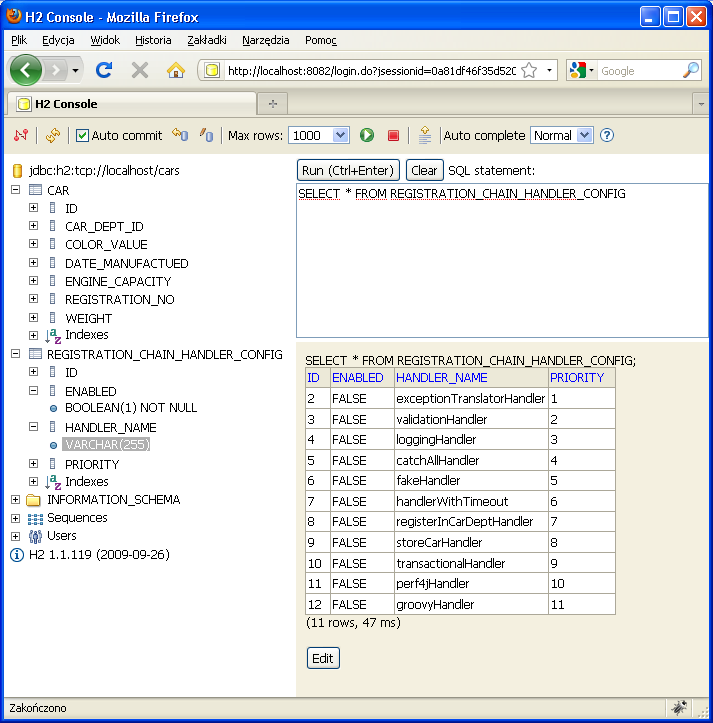 The configuration is moved to the database, but how this particular table is going to be populated? 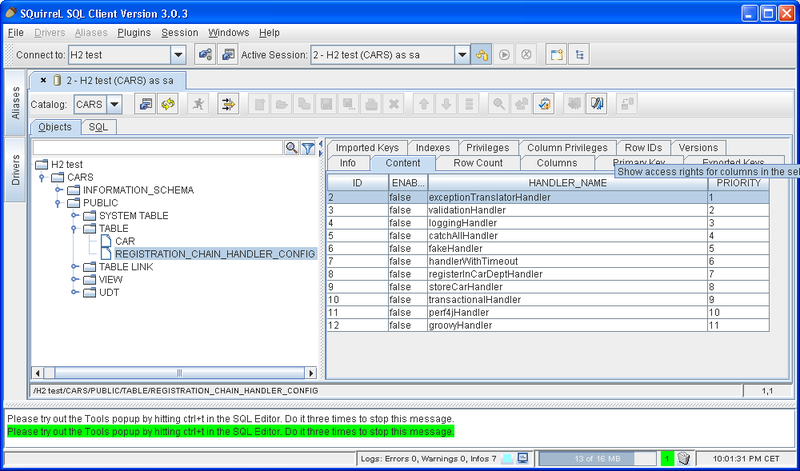 We can provide SQL script and update it every time new handler is added or removed from the application. But it is cumbersome and easy to miss when updating the application. 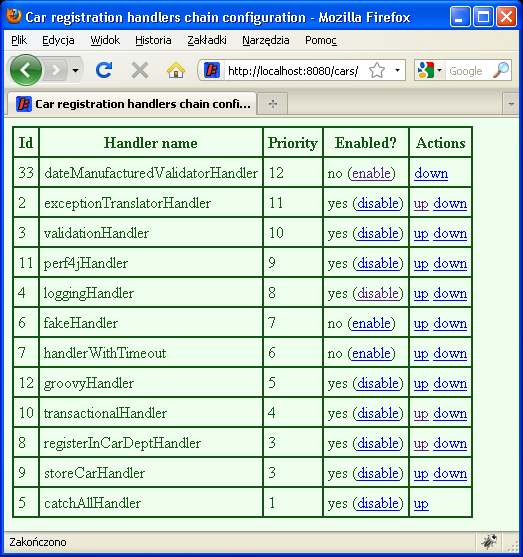 We could also provide web user interface to provide CRUD functionality on this table. Actually we will, but with a functionality limited to modifying existing entities (-RU-). 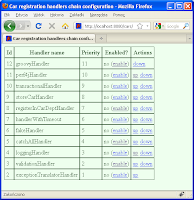 So how is the data going to be initially populated with handlers configuration? Well, we are going to discover all available handlers at application startup and keep them in sync without any user or administrator attention! Thanks to this brilliant mechanism whenever developer adds any new Spring bean implementing RegistrationChainHandler, it is going to be picked up and ready to serve in chain. So let’s go! The code is not so sophisticated as it sounded, although I skipped logging and huge part of logic, but core has left. As you can see first we load all the handlers in the database (existingHandlers) – this list is empty when running for the first time. 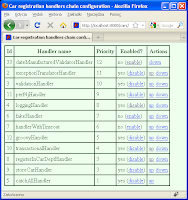 Then we obtain all Spring beans which implement RegistrationChainHandler (availableHandlers). This sounds complicated but is actually very simple since Spring provides utility for that. 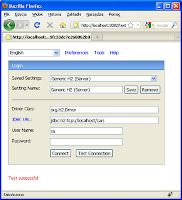 Simply inject ListableBeanFactory or implement BeanFactoryAware. I hope that names removeNotAvailableHandlers() and addNewAvailableHandlers() are descriptive enough and speak for themselves. First one scans through the handlers already found in the database and removes those, which are no longer present in Spring application context. The second one does the opposite: it goes through all Spring beans implementing handler interface and, if they yet do not exist in the database, adding them with default configuration. The defaults are: biggest priority (beginning of the chain) but disabled. 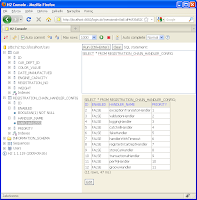 If you wonder why not simply clear the database table and repopulate it each time the application is started, the answer is very simple. When this process adds new handler, it puts it at the beginning of the chain. But since the order in which Spring beans are processed is undetermined, you end up with some random chain configuration. It is up to user (by using the GUI which is just about to be implemented) to customize the chain and persist it. 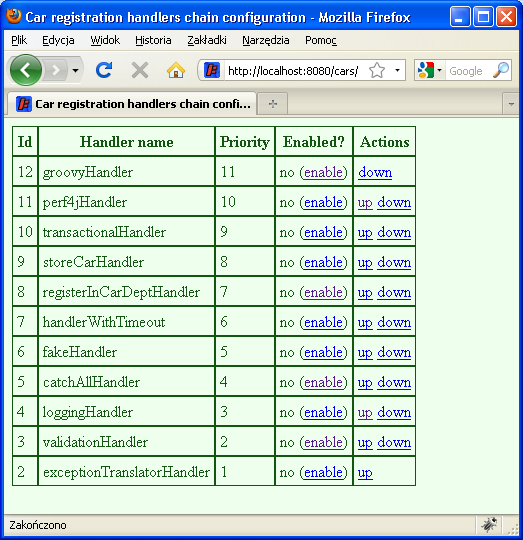 If the database was cleared every time, the user would have to configure the chain all over. BTW the same code using Groovy, aren’t closures great? Also you can see the random chain configuration. If we were to run our SoapUI functional test prepared in previous article, familiar error message would appear that the end of chain has been reached. Actually, the request road wasn’t so long – since all handlers are disabled by default, no handler has been executed before reaching the end. This is a solution for a common problem in my job: during functional or load-testing some external systems which we integrate with are too hard to configure or simply unavailable. Because the tests must go on, we build fakes and mocks that mimic the behavior of external, third-party system and work on them as long as the real system is not available. Sometimes we even build several fakes, some with hardcoded data while others are configured from a flat file. But the biggest problem is switching the implementations back and forth. Even when both fake and real implementations have the same abstract interface (so switching the implementation has no impact on the rest of the code), the application must somehow discover which implementation to use at the moment (Spring context XML, properties file, JNDI property, etc.) Using the chain of responsibility pattern makes this usage scenario very clear and easy to develop. When you want to use fake, simply enable its handler (and make sure it comes before the real implementation handler). But when the real implementation should be used, disable fakeHandler and let the control pass through to the right handlers. You might even develop few fake handlers and enable/disable/arrange them in any way you want. log.trace "Running next handler attempt $attemptNo/$count"
So much has been said lately about Wicket that explaining this code is pointless. Actually, it is rather easy to read and understand, especially read together with corresponding HTML (focus on wicket:id attributes). Enough to say is that this page displays database-backed table with a few links controlling each handlers’ position and availability. Was it all worth it? All this logic, DAO, web interface – since all we had to do was to implement a simple business process with few steps? Well, stories that you can turn logging and validation on and off at runtime might not convince you. Also the ability to change the order of some operations might not be sufficient. But what about this scenario? A new team member has been given a task of implementing another step in car registration process: if the car has been manufactured more than 20 years ago, the registration should fail immediately. If the car is between 10 and 20 years, registration should succeed, but JMS message containing newly registered car must be sent for further validation. In a traditional approach a new developer would find some place in web service implementation and inject his or her code in a reasonably looking place. This is not only complicated, because lots of existing code must be studied, but also error-prone, very likely breaking existing functionality. But when using chain of responsibility pattern, each handler is decoupled from the others, so the developer only focuses on the handler he or she creates. 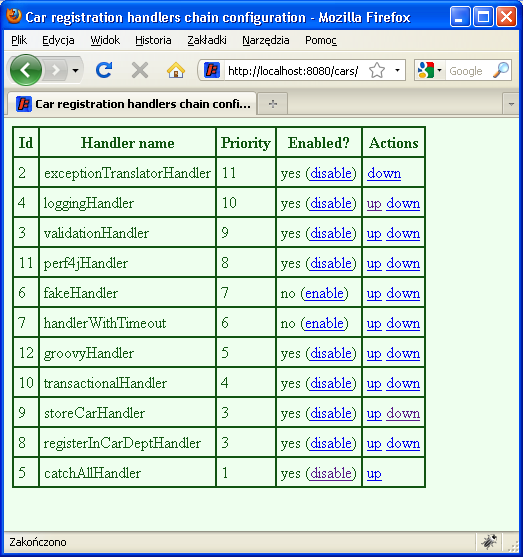 The handler can be easily unit tested, without worrying about other handlers behavior.